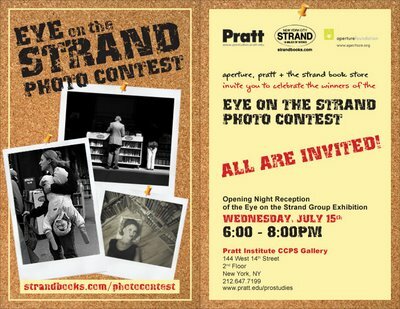 Last November I entered some photographs in the "Eye on the Strand" photography contest. The contest was a call for submissions from anybody with interesting, creative pictures taken inside or outside of the Strand bookstore. I entered on somewhat of a whim, but to make a long story short my picture of a woman carrying an upside-down baby outside Strand won second place in the contest. Co-sponsors of the contest were the Aperture Foundation and Pratt Institute, so along with a collection of over 50 photography books I will receive from Aperture I also get to enroll in a photography or computer class at Pratt this fall. Not bad for uploading a few jpegs! So if you're in New York in next few weeks I hope you will stop by the Pratt Institute Center for Continuing and Professional Studies Gallery on 14th Street in Manhattan to check out the exhibition. The opening is tonight, July 15th, from 6pm to 8pm. All are invited.